Groove Train from Evan McLeese on Vimeo. Interactive, high energy and always fun! 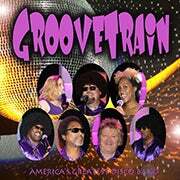 Groove Train loves to perform & it shows! It’s funky, it’s wah wahs, it’s platform shoes but most of all it’s a PARTY. 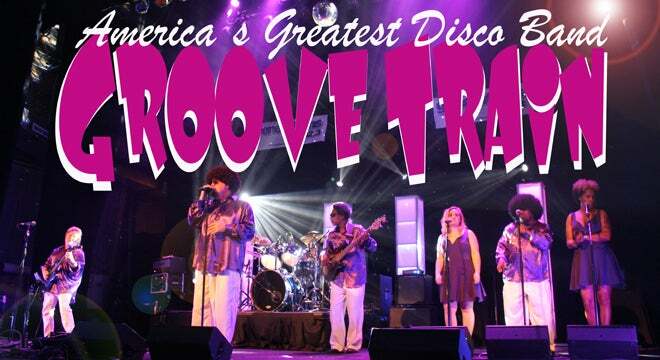 You can't resist the dance floor when Groove Train takes the stage. They will captivate you with an exciting blend of top 40 music from the days of disco, groovy costumes, outrageous hairstyles, and showmanship. After spending most of his teenage years teaching rich folks how to sing at summer camps in Virginia, "Booty Love" moved to New York and was the best bartender Club "54" ever had. When that shut down he decided to try his hand at leading a super group. So he put together the hottest disco act on the east coast. The beautiful but sometimes crazy Downtown Baby Brown grew up in the cold weather northeast. "Dee" studies astronomy in her spare time and before joining the band she worked at a local pizza parlor in her hometown of Mystic, Connecticut. She was accepted on partial scholarship to Yale University but singing, dancing and being on stage is her lifelong passion. "Madison" was a working-class girl who used to live on the wrong side of the tracks with her unemployed father. While working after school at the new-wave music store Hit-Trax and studying voice with a local voice coach she saw and ad for "female singer needed". She followed up with that ad and is now one of the hottest female singers in the hottest band this side of the Atlantic! Let’s just say Victor was in high demand as an adult entertainer in his heyday. He knew being in front of the camera was exciting and it certainly paid the bills but his love for music finally won over and he began a new career singing with Groove Train. He still has flashbacks of his previous employment at times. Born in Detroit, Michigan. Frankie started out his music career singing in the band "Flash" the band had moderate success in its heyday! After leaving Flash he toured with many funk and disco bands until he met Reverend Booty Love at a CD release party and the both have been best friends since. Titus T a guitar gunslinger from Encino, California. A man about town, walking softly and blasting the funk to the nation! This guitar hero met "Booty Love" while both were surfing somewhere in Thailand. They hooked up in southern California again about a year after that and they have been touring together ever since. Rudy Ray moved with his brother and mother from Baton Rouge, LA to Atlanta, GA right after grade school. While in high school Rudy moved in to help his ailing grandfather and he started working at the local car wash. While working at the car wash and picking up the nickname "Suds" Rudy was introduced to the wonderful world of music. It was there he learned his chops on bass guitar between car waxes and became the hottest bass player this side of the Mississippi.